As the St Patrick’s Day excitement and celebrations were coming to an end… the flow of green beer drying up and the green wigs shoved back in the cupboard to await their re- birth in 2014, I reflected on St Patrick’s Day past. Despite growing up in a family closely, and proudly, identifying with the Irish Diaspora I have no memory of celebrating St Pat’s Day. 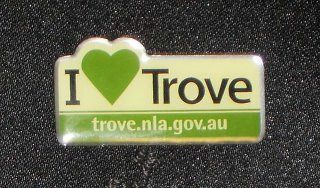 Curiosity aroused I turned to Trove for some answers. 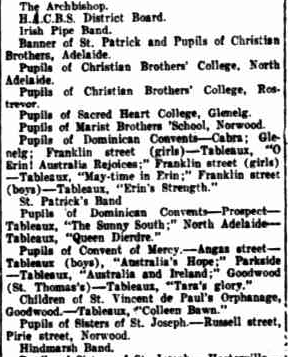 The first to catch my eye was from the Broken Hill “Barrier Miner” in 1897. After arriving from Ireland in 1855, as an 18 year old, my maternal Great Great Grandmother, Susan Kelleher Nicholls Rowen settled in the mid-north of South Australia. Thirty two years later, and 10 years before this article was published, Susan had separated from her husband and moved with her children to Broken Hill, New South Wales, Australia which is just over the border in the North East corner of South Australia. 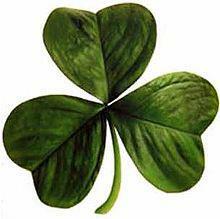 What a delight to read how she may have spent St Patrick’s Day, as a 51year old Irish immigrant, 116 years ago. 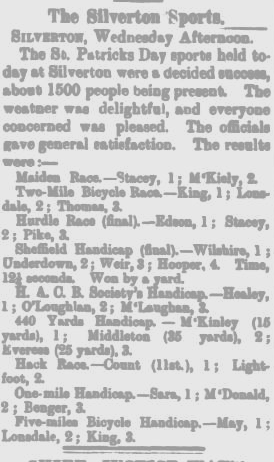 The next article, also appearing on page 1, described the sports activities held at nearby Silverton. 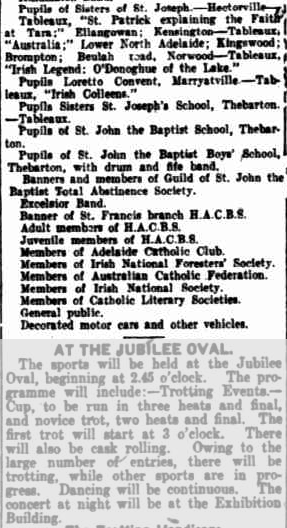 As my great great Aunt Susan’s husband was a manager of the mines in Silverton I expect the family living in Broken Hill and Silverton may well have attended these celebrations. Twenty seven years later my Nana, Susan Kelleher Nicholls Rowen’s grandaughter Elizabeth Mary Murray Evans Allan, had left her husband and three children in the mid-north town on Port Pirie and moved south to Port Adelaide with my Grandfather, Frederick Alexander Allan, and 12 months after St Patrick’s Day my mum was born… “on the other side of the blanket”… so I looked to the Adelaide newspapers to see what was happening there on St Patrick’s Day 1924. 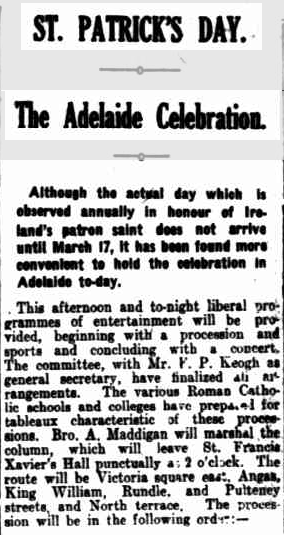 Clearly they celebrated St Pat’s Day in great style, in Adelaide 1924, and unlike today it seems to be largely a Catholic celebration. My mother certainly would never had been included because, being illegitimate, was unable to take up the Catholic faith and would have had to listen to her cousins, who all went to Catholic schools, talking about their celebrations, dressing up, performances and parades. Must remember to ask Helen about it. Now I understand why St Patrick’s Day celebrations were never a part of my childhood experiences. Barrier Miner, Broken Hill, NSW. 18 Mar 1897. Pg1. The Register, Adelaide, South Australia. 15 Mar 1914. pg9. 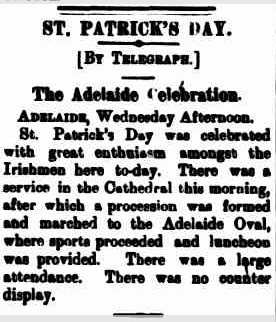 This entry was posted in Cultural Identity, Customs, Festivities, Ireland, TROVE TUESDAY and tagged Family History, Genealogy, South Australia, St Patrick's Day, Susan Kelleher, Trove Tuesday by Catherine. Bookmark the permalink. Wow Catherine, I learnt a lot from your post. I never knew the Irish were being taunted so badly and for so long and I didn’t know that illegitimate children couldn’t be part of the Catholic faith. How sad. Sorry to be slow to get back to you Kerryn… I’ve been a bit “off track” lately 😉 Yep, it was pretty YUK in the times of my Ancestors, and my mum, but thankfully it’s changed a lot now.